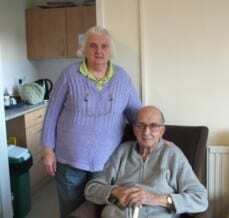 In their 80’s Mr and Mrs Smith are the only married couple living at Chelmsford Court and have been residents for 2 years. Bill has rheumatoid arthritis and is partially blind and were the first residents to have their bathroom refurbished. Bill particularly struggled with the bath and could not get out of it; the new wet room has created a lot more room for them. The couple chose to include a screen in their refurbishment.